Sorry... the 2017 Volkswagen Golf is no longer being sold as new. Instead, take the first step to a great deal on 2019 Volkswagen Golf with a free price quote! 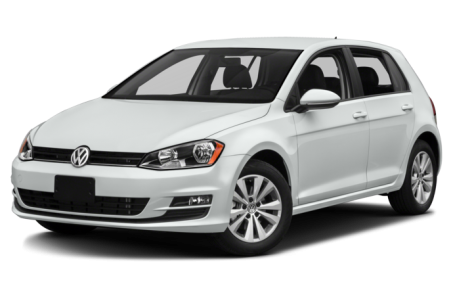 The 2017 Volkswagen Golf is a compact hatchback that has 2- and 4-door body styles. It competes with the Ford Focus, Mazda3, and Honda Civic. This year, a new Wolfsburg Edition is available as the highest trim level. In total, four trims are available: the S, SE, SEL, and Wolfsburg Edition. The Golf maintains a sporty appearance with its angular-yet-friendly headlights and smiley, wide-mouth lower fascia. The rest of the body is styled subtly without much ornamentation, which is typical of Volkswagen vehicles. Standard features include a rear spoiler and 15-inch aluminum-alloy wheels. Automatic headlights, a panoramic moonroof, and larger 16- or 18-inch aluminum wheels are available as well. Under the hood, the Golf is powered by a standard 170-hp, turbocharged 1.8-liter 4-cylinder engine mated to a 5-speed manual or 6-speed automatic transmission. Fuel economy for the Golf is an EPA-estimated 26/37 mpg city/highway. Inside, the Golf has a standard cloth interior with a 60/40 split-folding rear seat. With the rear seat folded down, it has 52.7 cubic feet of cargo room. The center stack feature the MIB II infotainment system with a new 6.5-inch touchscreen, Bluetooth connectivity for phone and audio, a USB port, and Car-Net App-Connect that allows you to access select smartphone apps onto the touchscreen. It can be upgraded with an integrated navigation system. Air conditioning, power windows/locks, cruise control, and a leather-wrapped steering wheel come standard. Available features include V-Tex leatherette seating, remote keyless entry, push-button start, and power/heated front seats. The Golf earned a full 5-star overall crash test safety rating from the National Highway Traffic Administration (NHTSA). All Golf models come with an automatic post-collision braking system and an intelligent crash response system. Forward collision warning, autonomous emergency braking, a blindspot monitoring system, and rear cross-traffic alert are also available.